Structurally, it is a solid metal structure consisting of sloping and horizontal parts and equipped with upper and lower movable ramp lips. The upper lip is placed directly in the body of the car, and the lower one helps to control the turning angle, making it smoother. If the height of a standard container lorry is 1.2 m, the turning angle is 8°, and the corresponding slope is 14%. In the front part there are wheels of standard size 5.00х8 and a jacking system designed on the basis of known JOST jacks of German production. The safety barriers are removable for the working convenience of the ramp. 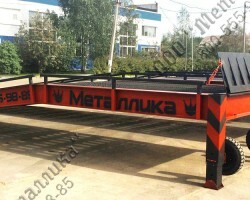 The loading dock ramp "Standard" is easily moved on-site by a single forklift with load capacity of 1.5 tons. 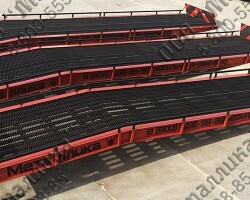 This model is the most popular due to its favorable combination of price, quality and functionality in mobile ramp series with load capacity of 7t. The construction quality is confirmed by ISO certificate and 36 months of warranty! All MLC MP Range ramps have the normal overall length and width. Shipment is possible in the vehicle of the customer or by a hired transport company. Our managers arrange delivery of any ramp directly to your site through proven logistics companies and at a good price. Delivery is carried out in all regions of Russia, CIS and Europe countries (see the geography of deliveries through the link:Link). If you are ready to provide your own transport for shipment, then the loading is done by our company and is absolutely free! "Standart" МР-B Mobile ramps 12m are put into series production, so they are always IN STOCK! RESULT: a ramp purchased, in addition to its practical functions, significantly reduces the labor force required for handling operations and, as a consequence, the budget. 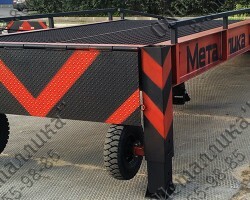 Welcome to the website of "Metallica", the manufacturer of handling storage equipment. All our products are supplied directly from the factory and can be delivered to any point of Russia and CIS. If you do not find your desired product on our website, just contact us or request a call back and our managers will prepare an individual offer for you.